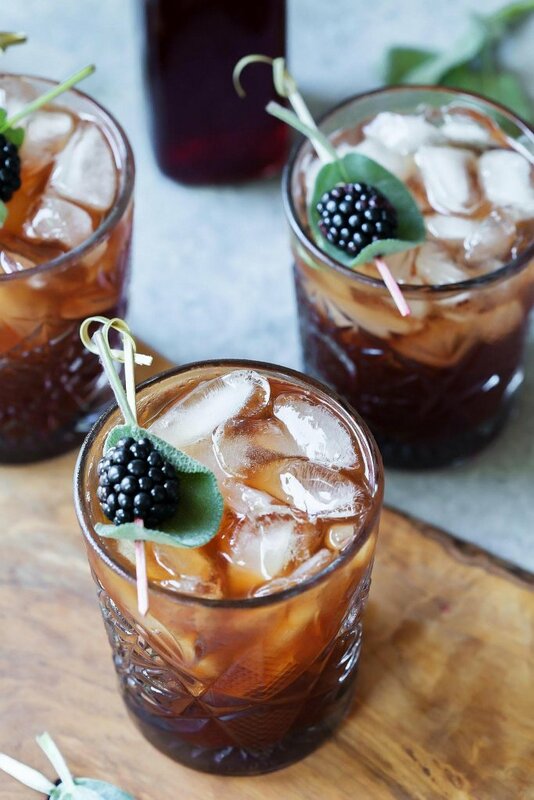 This Sparkling Blackberry Tea Cocktail combines tea, blackberries, sparkling wine and dry vermouth for a festive sparkling cocktail that’s perfect for holiday parties. 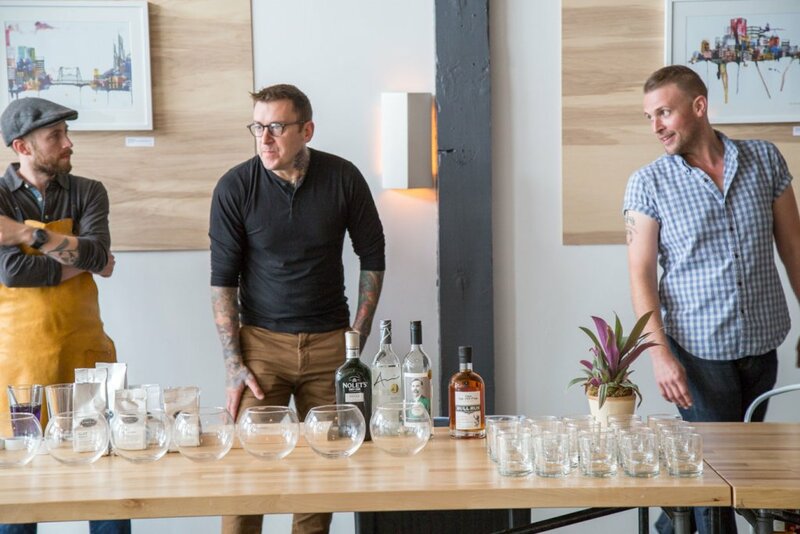 This summer, I had the pleasure of attending a hands-on cocktail class as part of Portland’s amazing food festival, FEAST. The focus was spiked tea cocktails. The experts at Bull in China teamed up with Steven Smith Tea to teach us how to make three unique cocktails, all featuring tea. 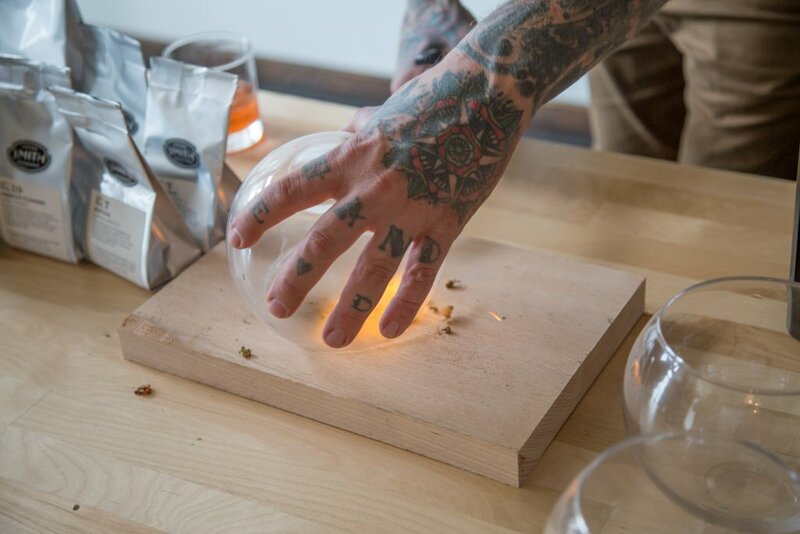 For our first cocktail, we learned how to smoke the tea, by setting it aflame and then covering it with a glass vessel to quickly put out the flame. 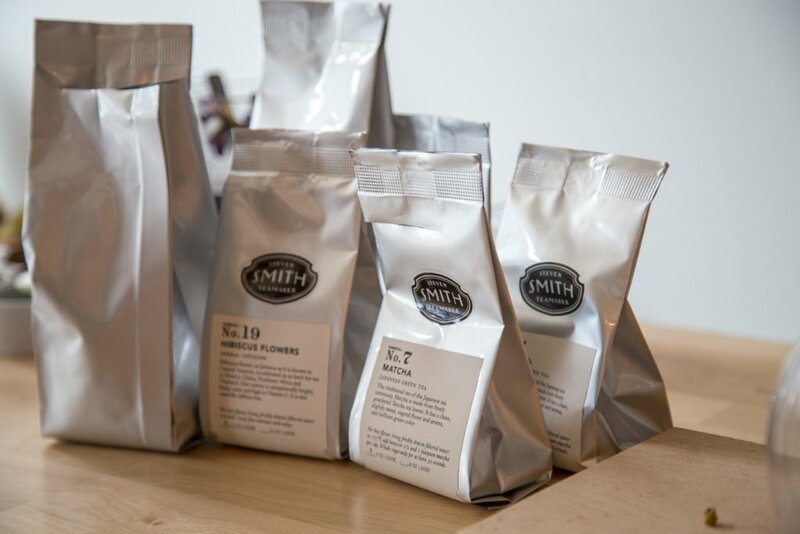 Each of us were able to select our favorite teas from the Smith Tea line and combine them with our alcohol of choice. I chose vodka and a hibiscus tea. As the two steeped together, it took on this beautiful ruby pink color and the flavors became more pronounced. When the tincture is as flavorful as you’d like, use a fine mesh strainer to remove the solids and then you can either use your infused spirit in a cocktail, or simply serve it over ice. 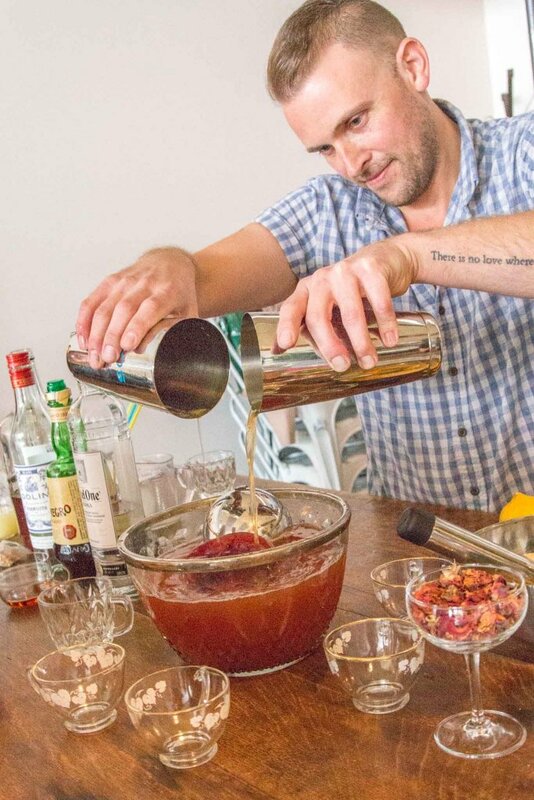 The second cocktail we learned how to make was a punch – A perfect option for when you’re serving a crowd. Takeaway tip from this session – Use a leftover Chinese food container to make a huge block of ice. It will melt less quickly, meaning that your cocktails won’t become watered down so quickly. 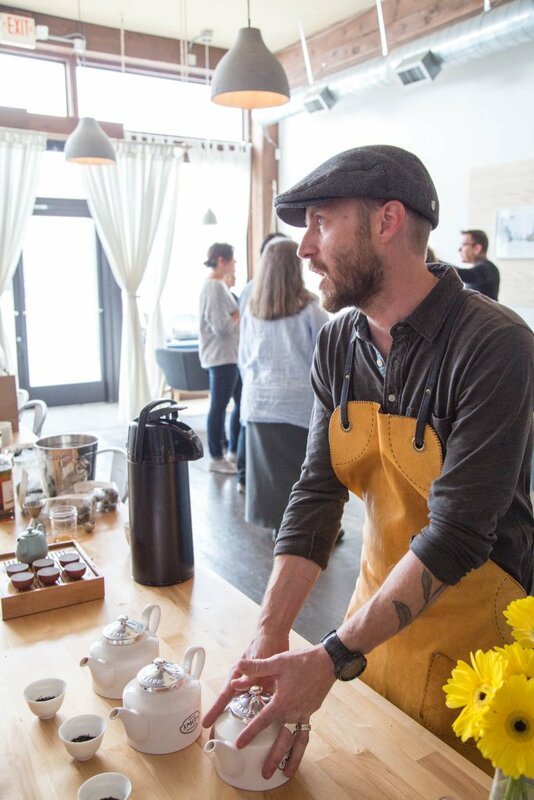 In our third session, we learned how to make a tea concentrate – Basically steeping a lot of tea bags in a moderately small amount of water and then using that concentrate to build a cocktail. 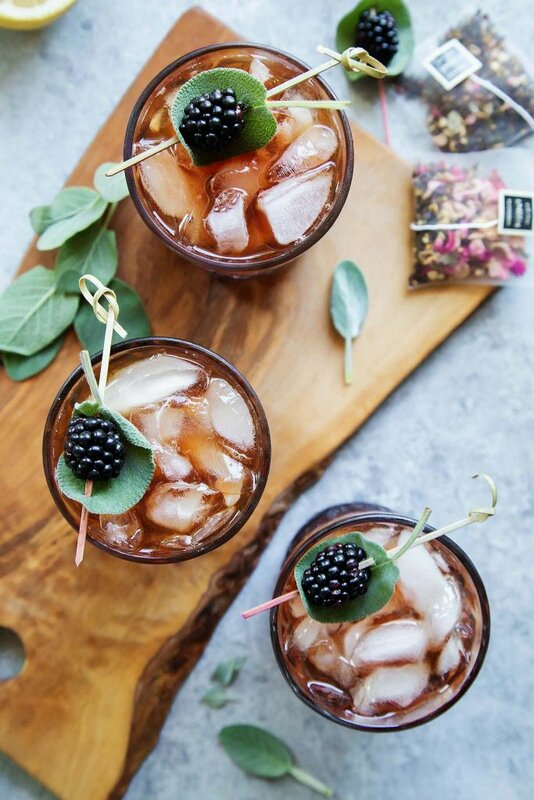 This method is the first one that I put to use at home and I used it to create this Sparkling Blackberry Tea Cocktail which I’m sharing with you today. 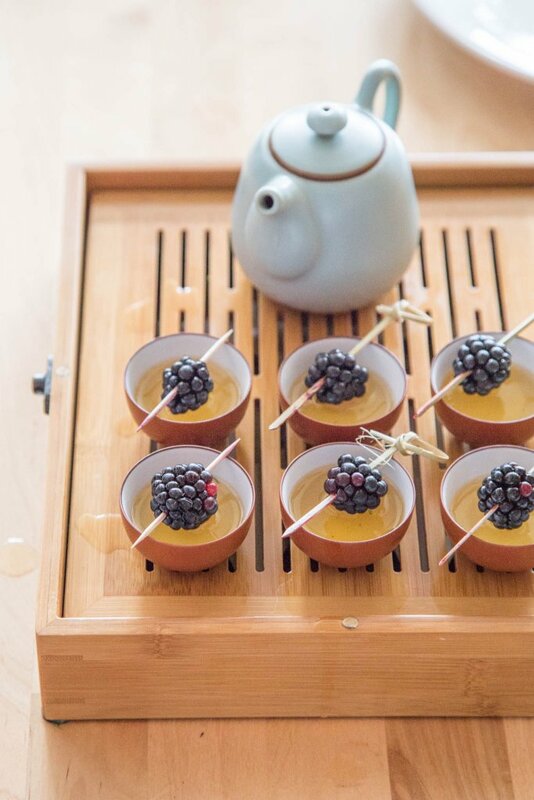 That tea concentrate and some amazing Oregon blackberries are the star in this recipe. I love how their deep purple color pops when they’re skewered with a fresh sage leaf. How gorgeous are these spiked tea cocktails? They would definitely be welcome on any holiday table. I’m thinking that they’ll be the perfect beginning to Thanksgiving dinner – A bit of an aperitif of sorts. 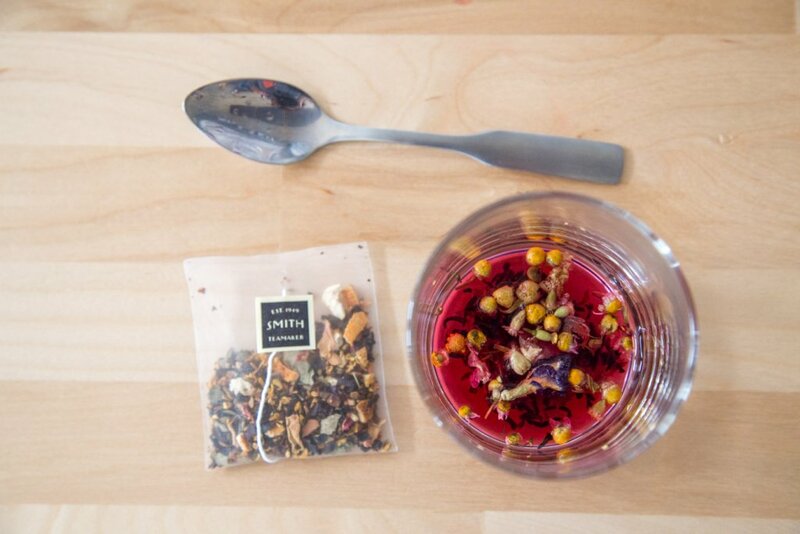 To make these cocktails, we’re really making two concentrates – A blackberry simple syrup and the tea concentrate. It may seem like quite a few steps, but the good thing is that you can make both at the same time, right next to each other on your stove top. Another great thing? Both can be assembled ahead of time – Up to a week. So, if you are hosting guests, all the hard work will be done ahead of time. This cocktail is totally customizable. 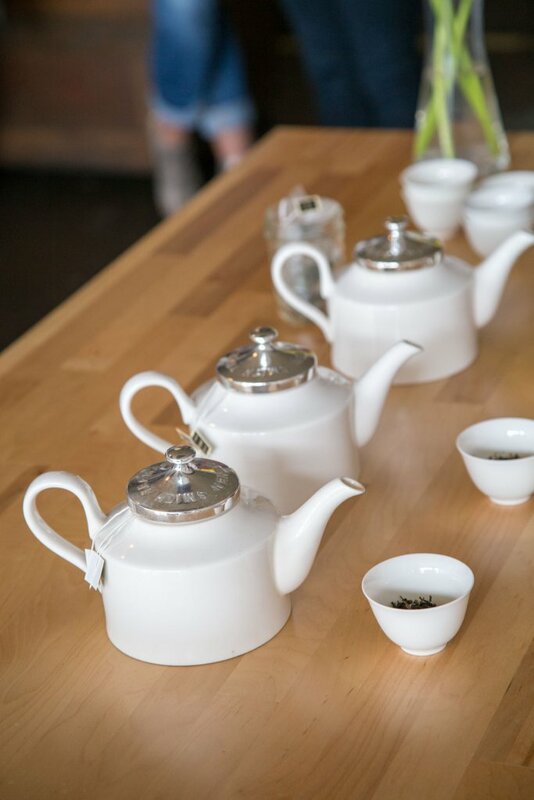 Use your favorite tea and make it your own. I loved the Smith’s Tea Astoria’s Amaro blend that we sampled at our cocktail making class, so I used that in my version. But, I’ll bet that an Earl Grey tea or a Hibiscus blend would be fantastic here as well. I also had some gorgeous Oregon blackberries on hand, so those were the star of my cocktail. But you could swap them out for blueberries or raspberries instead. As we speak, I’m dreaming up a Sparkling Raspberry Hibiscus Tea cocktail in my head. To assemble these beauties, simply add some tea concentrate, blackberry simple syrup, dry vermouth and lemon juice to an ice filled cocktail glass. 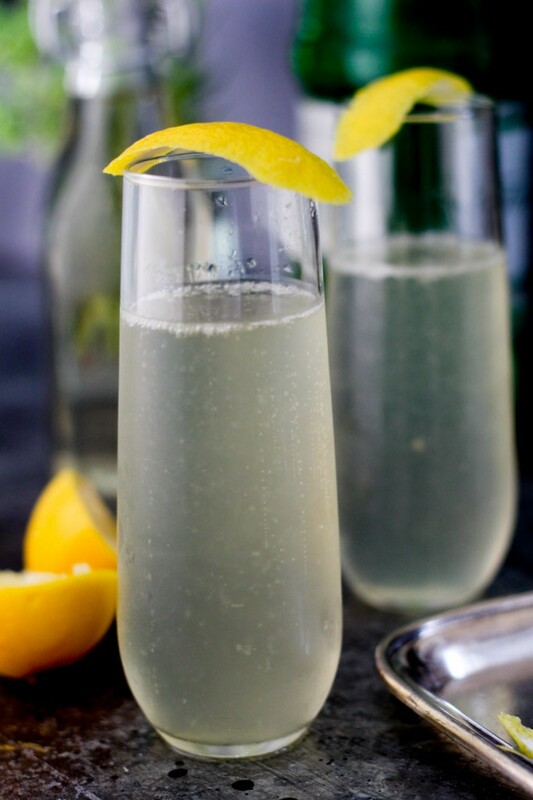 Give it a good stir and then top it off with some sparkling wine like Cava or Prosecco. 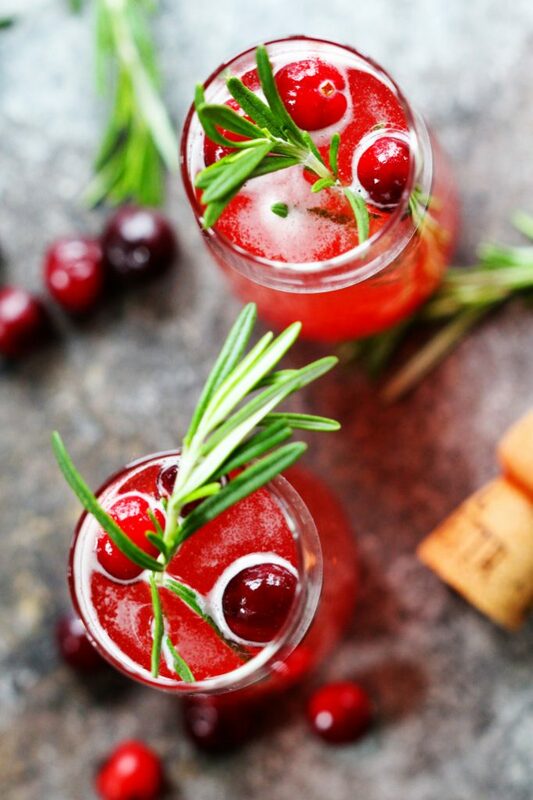 If you want, garnish your glasses with a fresh blackberry and a sage leaf – It’s a simple way to be extra festive. 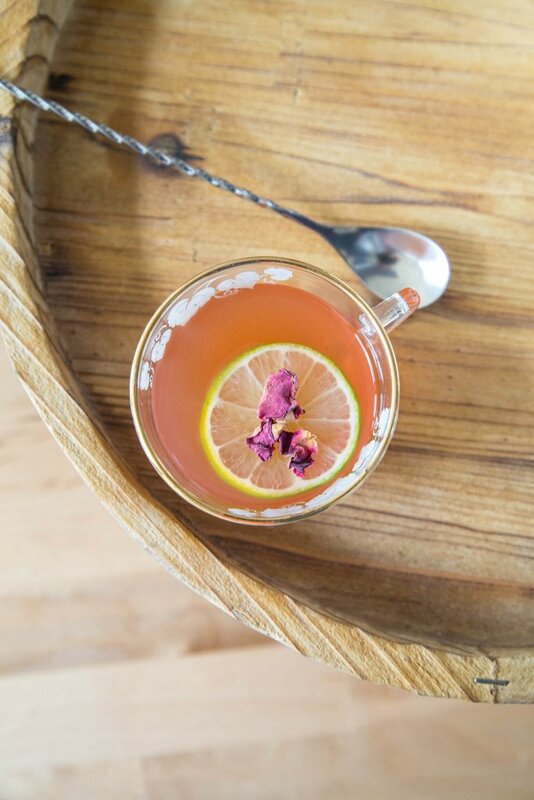 How would you customize your spiked tea cocktail? I’d love to hear in the comments below! Steep tea sachets in water just off a boil for 10 minutes. Remove and let cool to room temperature. Combine sugar and water in a small saucepan and heat over medium until the sugar dissolves. Once the sugar has dissolved, add the blackberries and increase the heat to medium-high. Bring the mixture to a simmer, cover, and simmer for 2 minutes, then remove from heat. Allow the syrup to cool, covered, for at least 20 minutes. Strain the syrup through a fine mesh strainer. Discard the berries. The syrup will keep in the refrigerator for about 6 months. 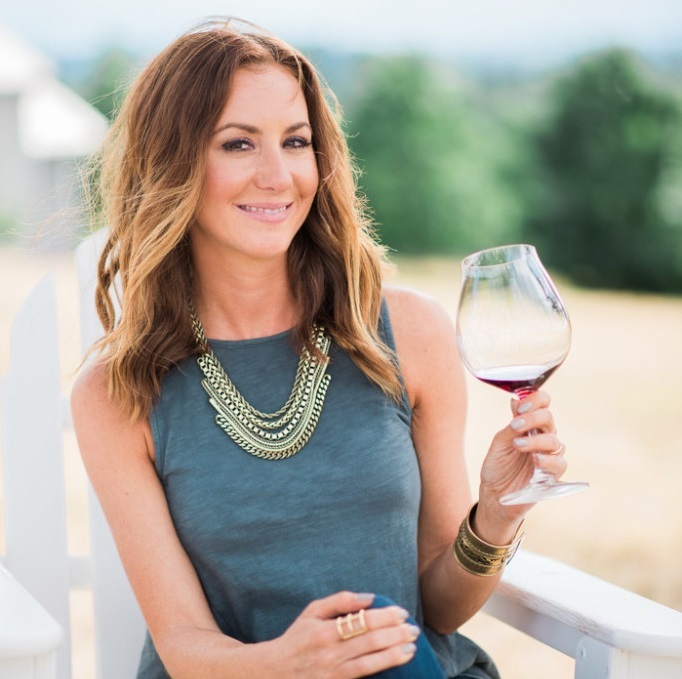 In an ice filled wine glass, add all ingredients except sparkling wine. Stir to combine. Top with sparkling wine and garnish with a sage leaf and blackberry. Disclosure: I teamed up with the Oregon Raspberry and Blackberry Commission to bring you this post. As always, all opinions are my own. 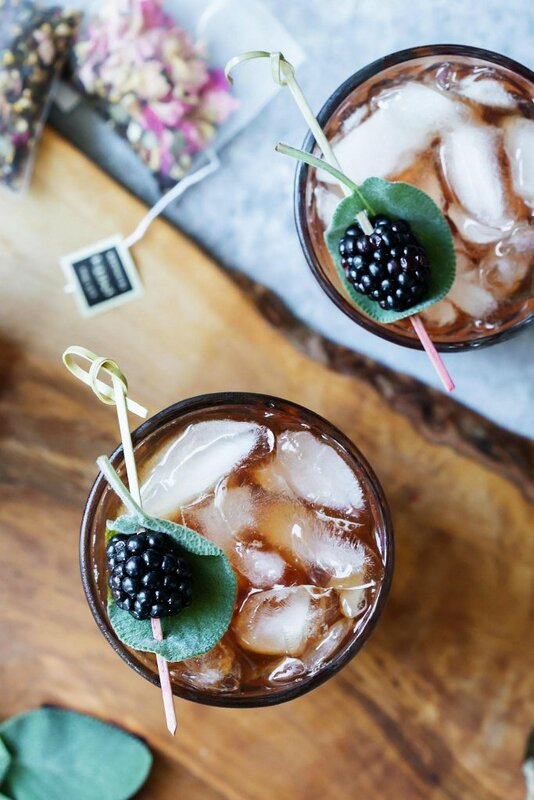 I love the idea of tea and blackberries together in a cocktail. What a delicious flavor combo! Lovely!! Sounds very tasty, I love tea flavors. The tea concentrate totally makes sense!! I’m drooling…all of these look so good, but I absolutely adore blackberries! Ooooh tea cocktails? Yes please! These flavors sound wonderful together, and I’m always a sucker for blackberries.